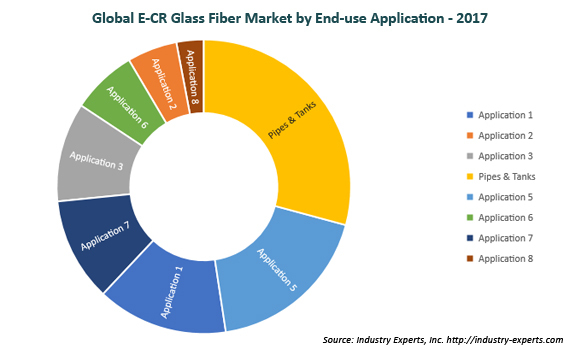 Wind Energy, Pipes & Tanks Applications to Drive Demand for E-CR Glass Fibers to Reach US$3.4B in 2022 – Market Report (2017-2022) by Industry Experts, Inc.
Industry Experts, Inc. published the new market research report on E-CR Glass Fibers. According to this comprehensive in-depth market report, exploring the market for major applications, entitled “E-CR Glass Fibers – A Global Market Overview” reveals that Asia-Pacific leads the global consumption for E-CR Glass Fibers, estimated at 43.3% share in 2017, which is also slated to post the fastest 2017-2022 CAGR of 6.2%. E-CR glass fibers (E-Glass Corrosion Resistant) are glass fibers with high chemical and thermal resistance compared to traditional E-glass fibers. E-CR glass fiber is widely used in a wide range of applications designed to face corrosive environments. E-CR glass reinforced composites offer better performance over traditional glass fiber in oil & gas, power plants, mining, marine, green energy, and water and sewage treatment industries. Pipes & tanks segment is the largest user of E-CR glass fibers globally, while wind energy constitutes the fastest growing segment for the consumption of E-CR glass fibers followed by pipes & tanks. The report reviews, analyses and projects the E-CR Glass Fibers market for the period 2014-2022, globally and the regional markets comprising North America, Europe, Asia-Pacific and Rest of World in terms of volumes in thousand metric tons and value in USD million. The global market for major applications of E-CR Glass Fibers analyzed in this report comprises Automotive & Transportation, Marine, Wind Energy, Pipes & Tanks, Building & Construction, Electrical & Electronics, Consumer Goods and Other applications. This global E-CR glass fibers market study includes 62 charts (includes a data table and graphical representation for each table), supported with meaningful and easy to understand graphical presentation, of market numbers. The report profiles 15 key global players across North America – 3; Europe – 2; Asia-Pacific – 8; and Rest of World – 2. The research also provides the listing of the companies engaged in E-CR glass fibers industry. The global list of companies covers the address, contact numbers and the website addresses of 27 companies. Industry Experts, Inc. announced the publication of an updated 2018 version of the report “Sterilization Technologies – A Global Market Overview“. Analysts at Industry Experts estimate that the Medical Devices applications accounted for more than half of the global market for Sterilization technologies in 2018 and the phenomenon is expected to continue through to 2024. Growth in demand for sterilization equipment and techniques is expected to be driven by greater emphasis on refurbishing of medical devices as a means of curbing expenses. Another factor reinforcing demand is the technological advancements made in medical instruments such as endoscopes and analyzers, which have, in turn, contributed to an increasing requirement for advanced sterilizers and techniques that are compatible with these instruments. Cornering an estimated market share of 38.1%, equating to US$3.2 billion, in 2018, North America leads the global Sterilization Technologies market and is expected to register a 2017-2024 CAGR of 6% to reach a projected US$4.6 billion by 2024. The global market for sterilization technologies in 2018 is estimated at US$8.5 billion. The market for Sterilization technologies analyzed in this report comprise Filtration, Heat, Radiation and Chemical. Filtration is estimated the largest technology in the global Sterilization Technologies market, demand for which is also anticipated to register the fastest 2017-2024 CAGR of 6.9% and reach a projected US$8.4 billion by 2024. 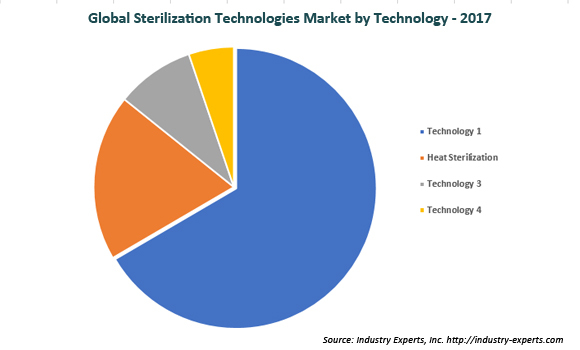 Sterilization Technologies’ applications market analyzed in this study include Medical Devices, Pharmaceuticals, Life Sciences and Other Applications (includes Food, Agriculture, Cosmetics, etc.). This report reviews, analyzes and projects the Sterilization Technologies market for global and the regional markets including the North America, Europe, Asia-Pacific and Rest of World for the period 2015-2024 in terms of value in USD. These regional markets further analyzed for 12 independent countries across North America – the United States and Canada; Europe – Germany, the United Kingdom, France and Spain; Asia-Pacific – Japan, China, India and Australia; and Rest of World – Brazil and South Africa. The market is analyzed in each region by key country, sterilization technology and major application. This 346 page report on sterilization technologies market includes 196 charts (includes a data table and graphical representation for each table), supported with a meaningful and easy to understand graphical presentation, of the market. The statistical tables represent the data for the global market by geographic region, technology type and major application area. This study profiles 22 key global players and 37 major players across the North America – 24; Europe – 10; Asia-Pacific – 1; and Rest of World – 2. The report also provides the listing of the companies engaged in research & development, manufacturing, supply and provision of sterilization equipment, technologies and services. The global list of companies covers addresses, contact numbers and the website addresses of 127 companies. 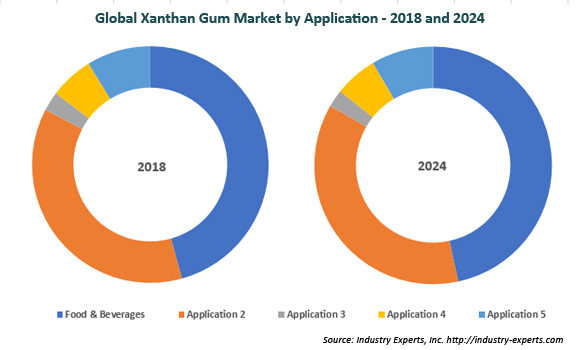 Largely Driven by Food & Beverage and Oil & Gas Sectors, Global Demand for Xanthan Gum is Forecast to Reach 323K Metric Tons by 2024 – Market Report (2018-2024) by Industry Experts, Inc.
Industry Experts, Inc. introduced the comprehensive global market report on Xanthan Gum. The new report entitled “Xanthan Gum – A Global Market Overview” reveals that the global market for Xanthan Gum is estimated to cross 240 thousand metric tons in 2018. Global market for Xanthan gum, estimated at 240 thousand metric tons in 2018, is further projected witness a CAGR of 5.1% through to the period 2024. Food & beverages is the largest application segment for Xanthan gum with an estimated share of 46% while the segment is also witnesses the fastest growth during the aforementioned analysis period. Industry Experts, Inc. released the updated version of its global market report on Personalized Medicine. 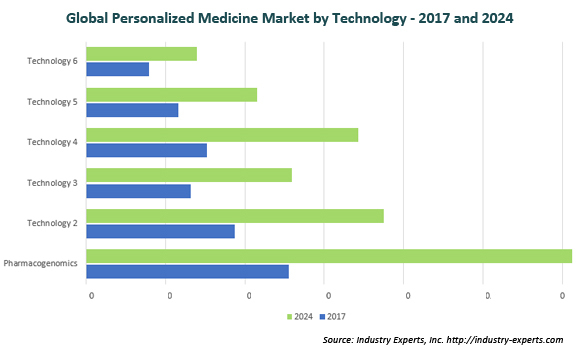 The new report entitled “Global Personalized Medicine Market – Types, Technologies and Applications” reveals that the global market for Personalized Medicine is forecast to touch US$102.7 billion in 2018.